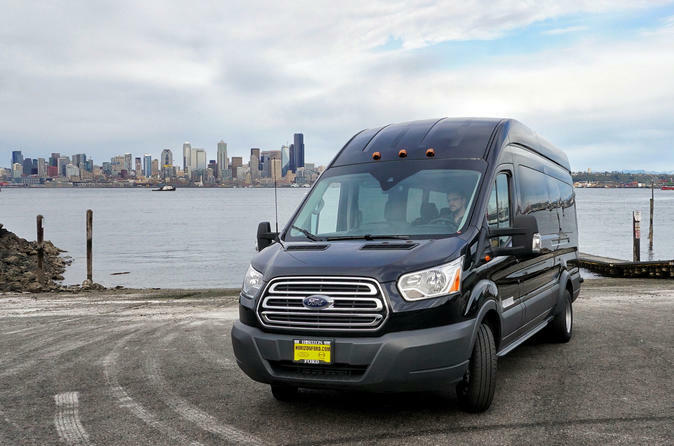 Make your transfer between Sea-Tac Airport, Cruise Terminals (Pier 66 or Pier 91) or downtown Seattle smooth and stress-free by arranging for private charter transportation. We specialize in transport for groups of up to 14 people. Don't let the words "charter" or "private" mislead you. We believe you'll find our services delightfully affordable compared to other options out there. This is a basic transfer service between these points. If you require a longer duration of service or service radius, please look for our half-day or full day charter services also listed on Viator. Your professional driver will greet you at the designated pick-up location in a new Ford Transit 350 XLT High-Roof, Extended Length Wagon. Your driver will help you with your bags, provide you with bottled water, reconfirm the route for the day and you'll be off. With a maximum of 14 passengers, the vehicle has capacity for at least 6 large pieces of luggage. If your group is smaller than 14, the van will be able to accommodate additional luggage in the cargo area. If you have a large group with a lot of luggage, please discuss your requirements at the time of booking and we will make the necessary arrangements to accommodate your needs. Subject to the availability of vehicle and driver, this service can be reserved at any hour of the day, at any time of year. No matter your trip length, we'd like you to know we take safety seriously!